Nothing much to report around here. I’ve been eating carb-heavy things all day like pita and hummus and oatmeal and almond butter. I’m able to eat and getting hungry as usual, my stomach just doesn’t feel right. Needless to say there was no post-work workout. 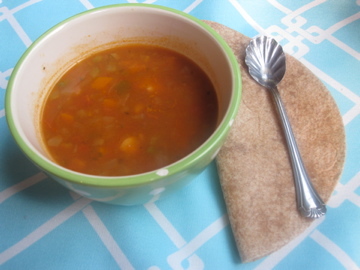 Dinner was just a can of Amy’s vegetable soup and a WW tortilla napkin (x2). Planning on feeling 100% tomorrow for 6am spin. Positive thoughts! oh gosh i hope u feel better! positivity ALL THE WAY~ !! ohhh! i hope you feel better for spin! I read your post from this morning but couldn’t comment until now. Hope you are feeling better sweetie! Feel better! And if you miss another workout don’t stress..it happens! Hope you’re feeling better and are hitting up that spin class as I type this!